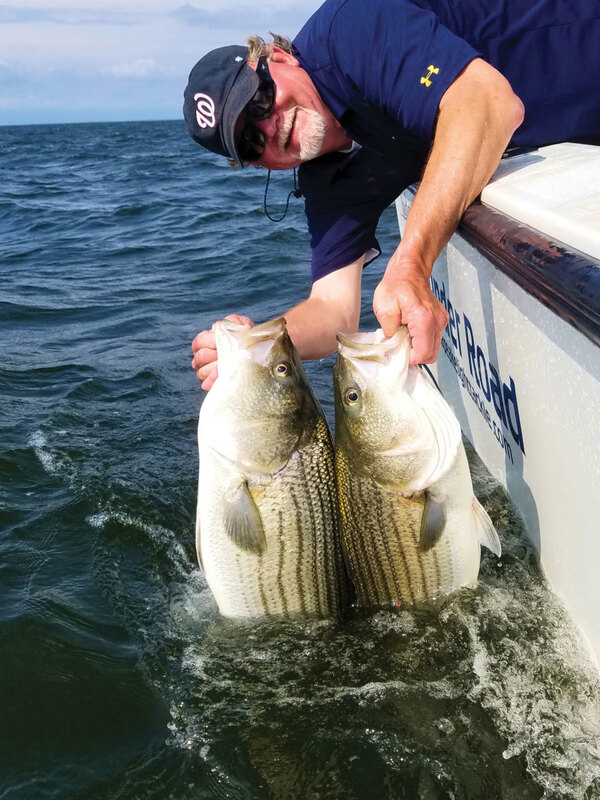 Chesapeake Light Tackle author Shawn Kimbro with a summer striped bass double- header. Suddenly, a beautiful tidal seam appears before us, off one of the island’s sandy points. Surely there must be fish here. With streams of sweat pouring from my brow, I do a backcast with a top-water fly into the middle of the seam and expect an immediate explosion. Five minutes later, we’ve made four drifts, and the fish remain as tight-lipped as a monk who’s taken a vow of silence. This, unfortunately, is a fairly common scene during hot, hazy and humid summers, which often last straight into the first two weeks of September. 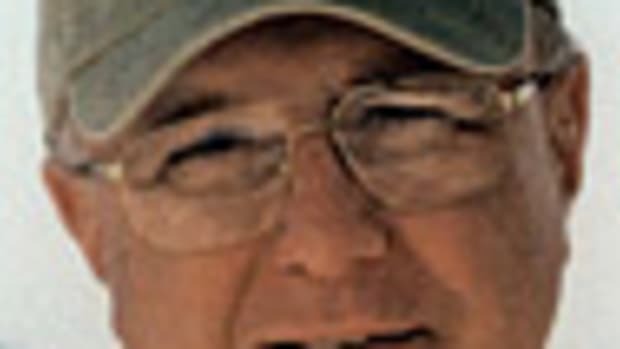 In fact, striped bass fishing during the dog days can be among the most challenging of the entire season. The fish don’t like the heat any better than most humans, so finding them can be frustrating. And getting them to eat is another task entirely. 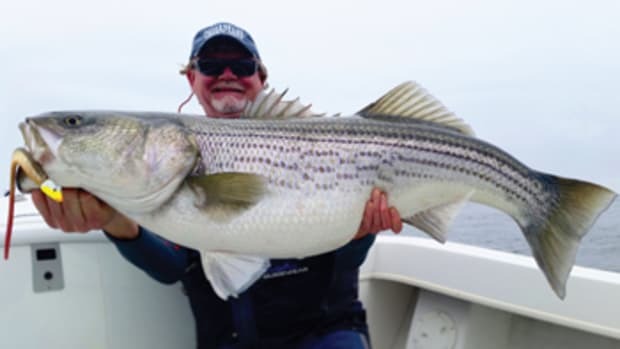 Still, if you know where to look and which tactics to use, summer striper fishing on Chesapeake Bay can be quite rewarding. The best way to understand the mind-set of a summertime striper — and hopefully catch a few of them — is to know what these fish seek out when water temperatures push into the mid- to upper 80s. First, they tend to go where they can get some relief from the heat. That often means they’ll gravitate toward deeper holes, shaded areas under bridges and piers, or shallows that cool rapidly during the evening. And regardless of temperature, striped bass like structures where they can hide and ambush bait. Bridges, rock piles, piers, oyster bars and breakwaters are good places to prospect. When your fishfinder says water temps are in the mid- 80s, you’ll also want to look for ledges with sudden drop-offs into deeper water, such deep structures as industrial pipes and manmade reefs, and indentations in the bottom where fish can seek relief from the heat. Other good places to look, especially if you fish just before sunrise, are the shallows. Striped bass often move into these areas overnight, as they tend to cool quickly during cool evenings. These shallow areas are also a good place for them to find smaller forage fish to ambush. Work these areas with top-water patterns, such as plugs or surface flies, early in the day. I’ve caught some of my largest summertime stripers simply by making a half dozen casts in the right shallow spots with a top-water plug or crease fly first thing in the morning. 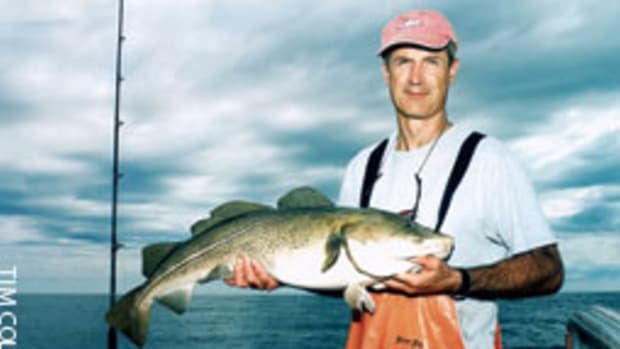 Anglers far more talented than I tell similar stories. And speaking of top-water action, keep an eye out for birds over breaking fish; it’s not just a fall phenomenon. 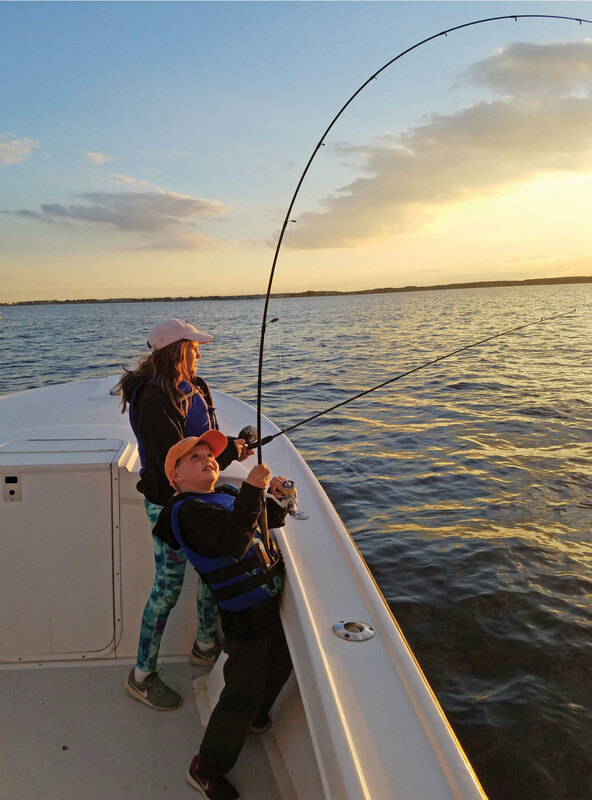 Ella and Tucker Kimbro get in on some early evening striped bass fishing in Middle Chesapeake Bay. 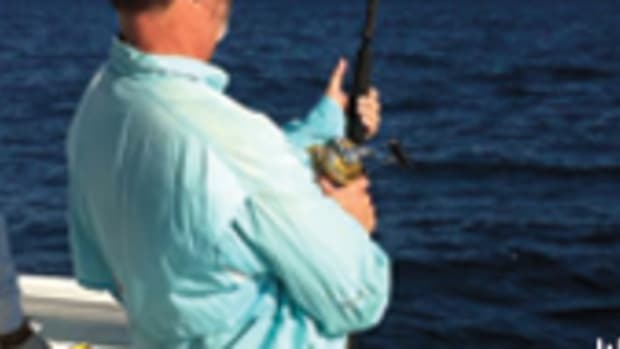 Finding the right place to fish is important, but locating a spot with an active tidal current is essential to hooking up. Your finder may show a screen full of fish beneath your boat, but striped bass often will remain lockjawed if the water isn’t moving. Even if you’re on the prettiest piece of structure and your finder is showing wavy lines of fish everywhere, move somewhere else if the current is slack. If it’s a 20-minute hike to find moving water, it’s often well worth burning the fuel. I keep the Tide Graph Pro app on my smartphone to locate nearby areas of current. The tackle and tactics you’ll want to employ for summertime stripers on the Chesapeake are similar to what you’d use during the rest of the year, with a few exceptions. Light-tackle anglers will want to fish with spinning or bait-casting gear rigged with the appropriate lead jig heads and soft plastic jigs from Bass Kandy Delights, Bust ‘Em Baits, Gulp! or D.O.A. 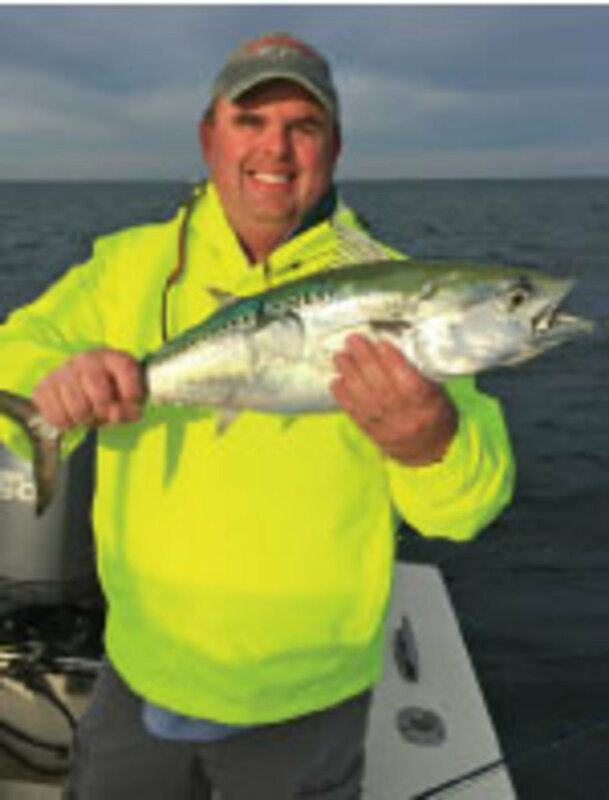 If you’re new to jigging or light-tackle angling altogether, consider picking up Shawn Kimbro’s book Chesapeake Light Tackle: An Introduction to Light Tackle Fishing on the Chesapeake Bay. 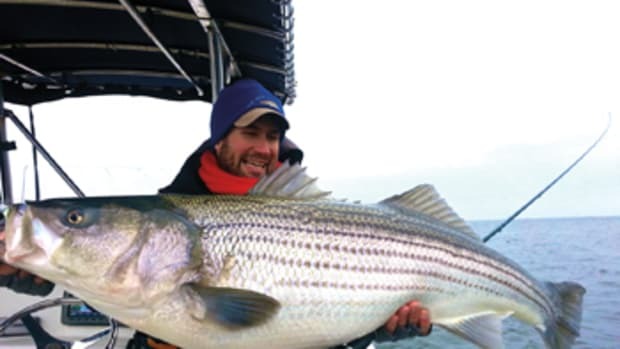 It’s a well-regarded guide to angling for striped bass on Chesapeake Bay through all the seasons. The Bay is a popular place for fly anglers to get in on some striped bass action, too. Most will want to rig up with two rods to cover a variety of situations. A good all-around rod is a 7- to 9-weight, 9-foot, fast-action version with a wide- arbor reel that has a sturdy drag system. Rig one rod with floating line for such top-water flies as gurglers, crease flies and poppers, and one with full-sinking line to fish Clouser deep minnows, Lefty’s deceivers, Popovics hollow Fleyes and other underwater patterns. If two rods aren’t in the budget, get a spare spool rigged up with floating line, since you’ll most often be fishing a sinking line. It’s not always easy to change fly line in the middle of a productive striper bite, but it’s a nice option to have. Because stripers are not even remotely leader shy, a tapered, 8- to 10-foot, 16- to 20-pound fluorocarbon leader should work well in most situations. Fishing with bait — live or dead — is another popular way to catch stripers. A method that’s become increasingly popular during the past decade is live-lining with spot (a small baitfish native to the Bay). First, catch some spot with a weighted double bottom rig and bloodworms. Yes, you have to buy bait to catch bait. 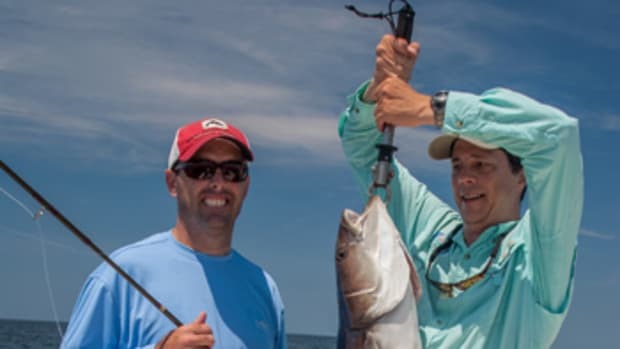 Fish for the spot in such shallow locations as oyster bars and sandy shoals, carefully removing the hook before tossing the spot into your live well. Once you’ve caught a few dozen spot and located a prime striper fishing hole, rig up your rod with a 10-foot length of 30-pound fluorocarbon tipped with a 3/0 circle hook. Hook the spot through its tail, through its back just in front of the dorsal fin or through its nose, depending on how you want the fish to behave underwater. If you want the spot to swim up from the bottom, as you will when fishing in shallow water, hook it through the nose. Hooking the spot in the other two locations will encourage your spot to swim down — good for deeper water. Chumming involves anchoring and deploying a chum bag or bucket filled with chopped-up frozen menhaden, which can be purchased from any good tackle shop. As the chum block thaws, bits of fish fall away and drift behind the boat, attracting stripers and other fish. Once you have a good chum slick behind your boat, rig up a 10-foot piece of 30- pound fluorocarbon with a 6/0 circle hook on your spinning rig and bait it with a nice, big chunk of menhaden. Drift your offering back in the slick and wait for the bite. Drop shot (lead weights) can be added if the current is strong and causes your bait to ride too high in the water column. Fly anglers also can set up a chum click to attract fish, then retrieve a fly through the feeding frenzy. Some folks call this cheating; I call it fun. better, and the sooner it’s back in the water being revived, the more likely it will survive to fight another day. 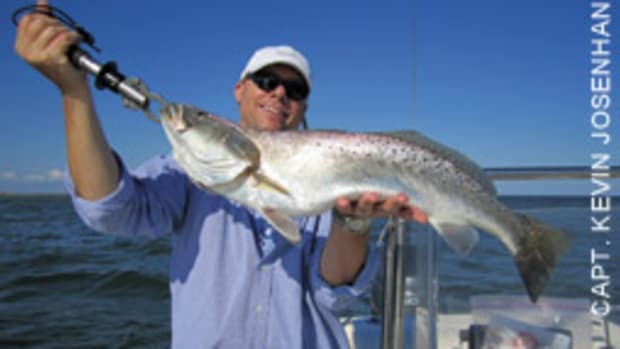 No matter where you find yourself on Chesapeake Bay during the summer months, there’s almost always an opportunity to tangle with the region’s most popular gamefish. It doesn’t matter whether you target them with lures, flies or bait. You’re going to have a blast catching tons of these feisty and strong-fighting fish. You might even forget how miserably hot it is outside.